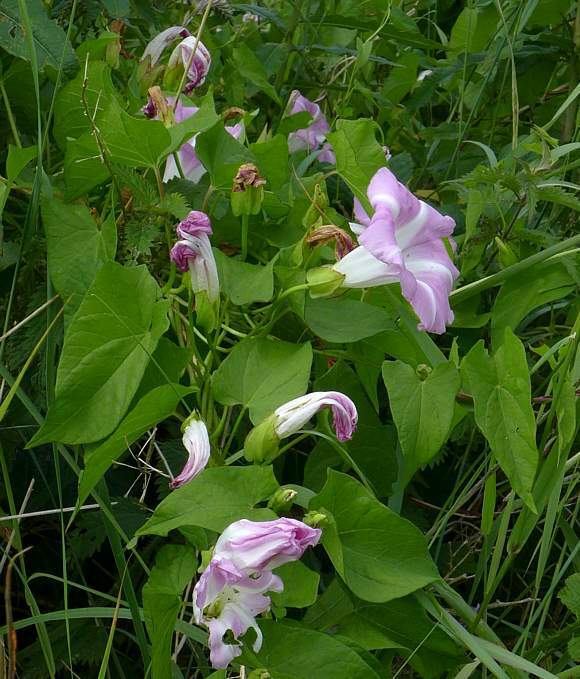 Stems to 2m or longer, scrambling by twining about other plants. 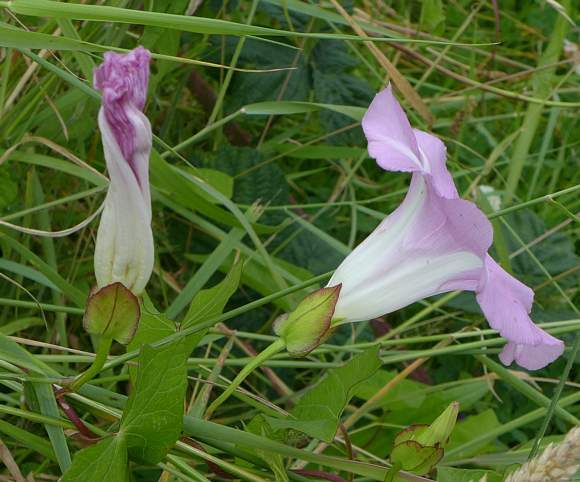 Flowers 30-50mm (55mm) across, usually white, or pink with white stripes (f. colorata) which is especially preponderant in Ireland. (ssp. 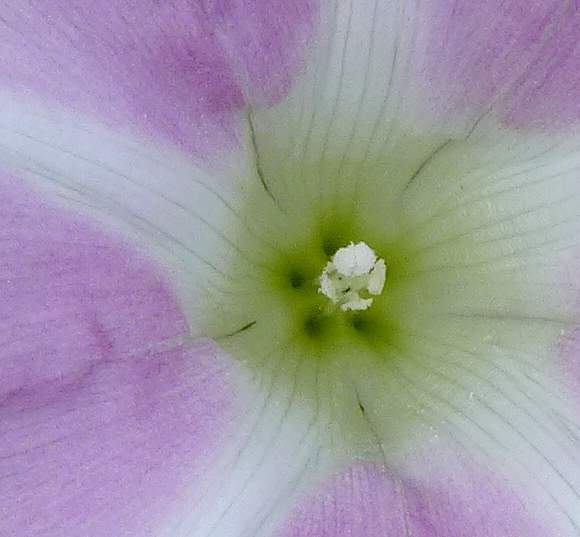 roseata has a wider corolla, 40-55mm across and is always pink with white stripes). 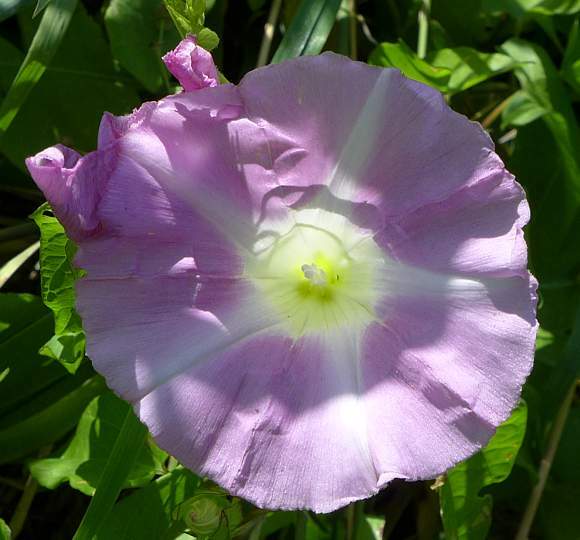 Sepals isosceles triangular shape. 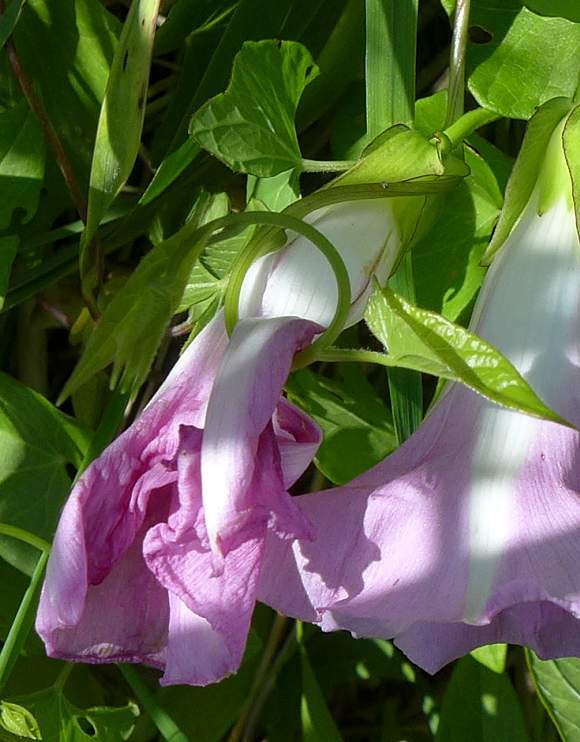 Even twining around its own flowers. This one twining clockwise. 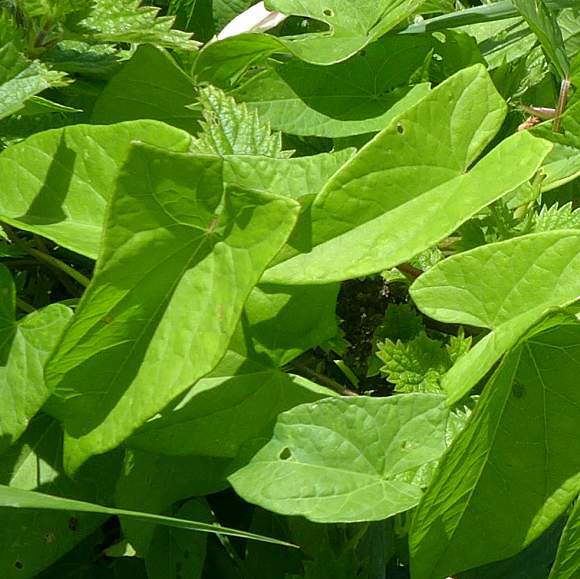 A small stem-leaf half obscuring the bracteoles cupping the sepals. Petals may or may not be out-rolled. Stamens 15-25mm long in ssp. 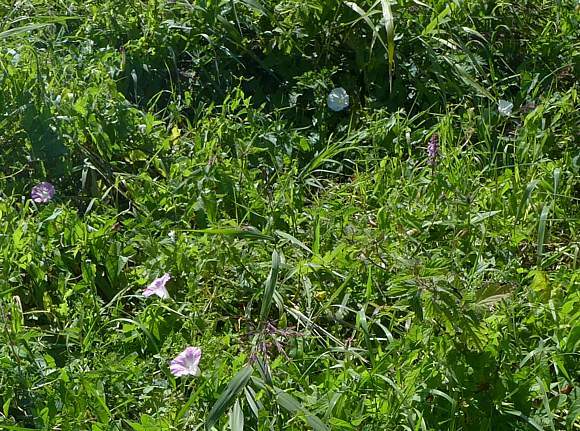 sepium (up to 2mm longer in ssp. roseata). Two as yet un-opened flowers peek our top left. 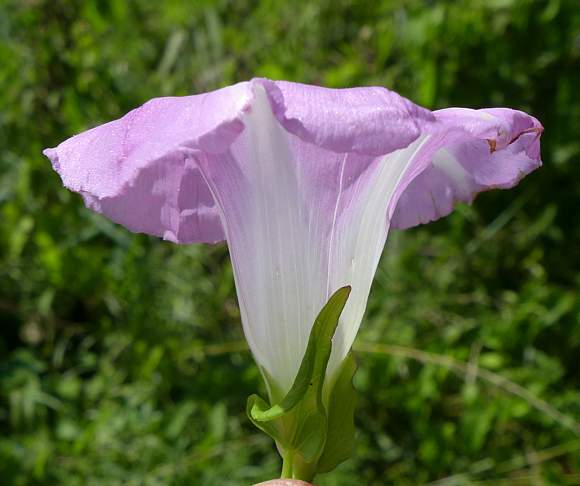 There are 5 fused petals, fused and folded longitudinally along the white strip. 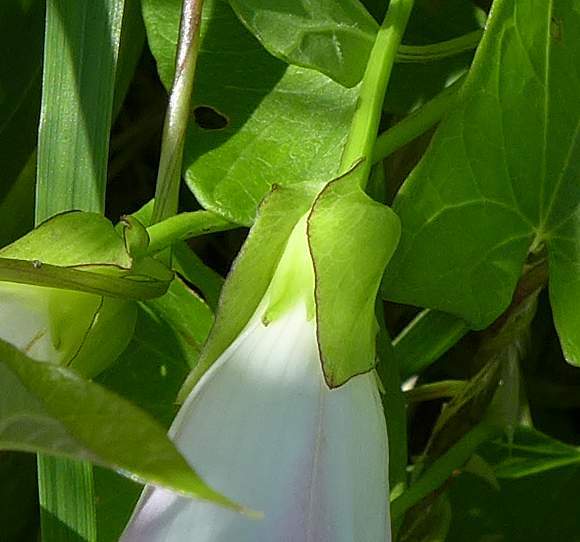 Leaves triangular and saggitate (as are all Calystegia species except Sea Bindweed where the leaves are kidney shaped). 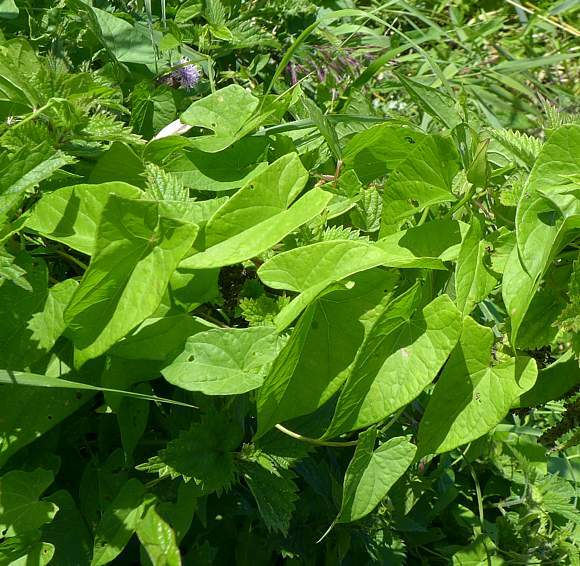 Leaves have a sharp notch where they join their stems. 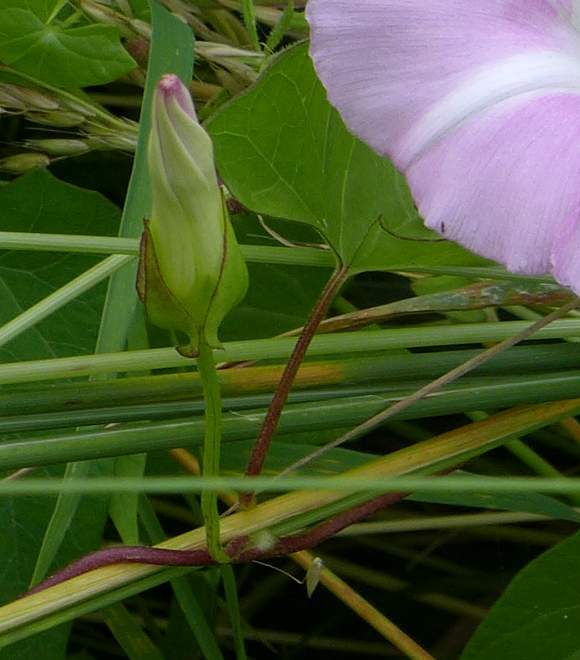 Hairy Bindweed (Calystegia pulchra) to produce Calystegia × scanica which is intermediate between the parents but only partially fertile. 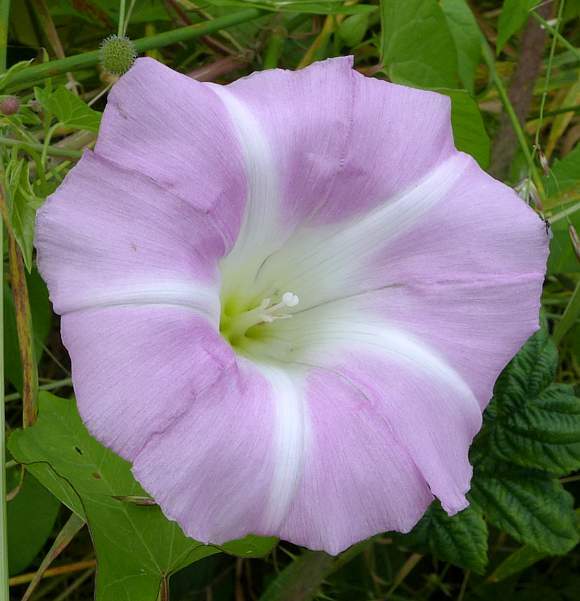 White to pale pink corolla 4.5 - 6.5cm, and with slightly longer stamens 22 - 28mm long. It is scattered in the Channel Islands and central and southern Britain. 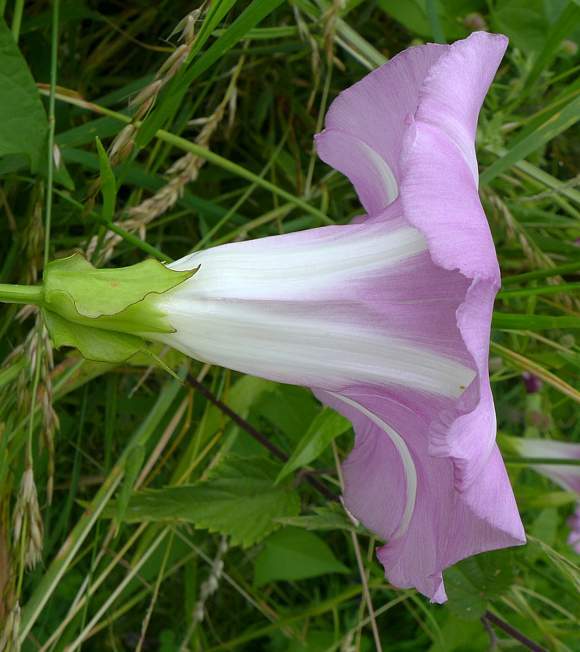 Calystegia sepium ssp. 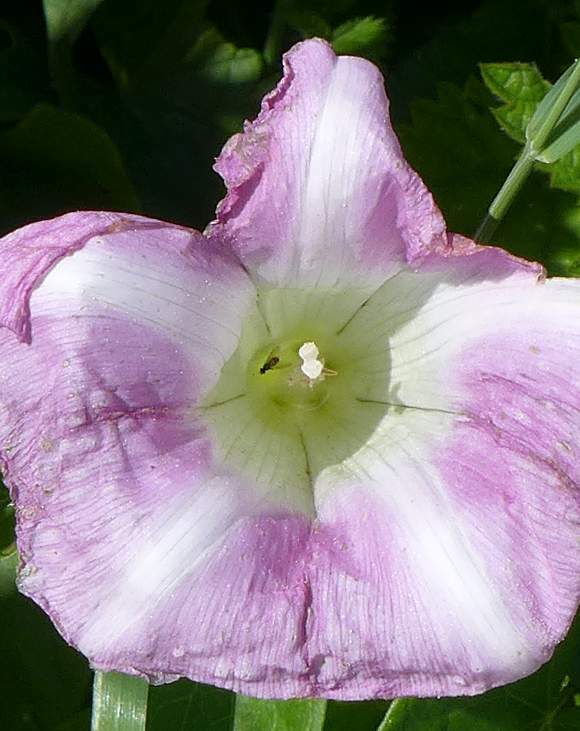 roseata which has pink flowers with 5 white stripes, can have a slightly larger corolla (4 - 5.5cm); stamens 17-25mm long, which is found throughout the British Isles. 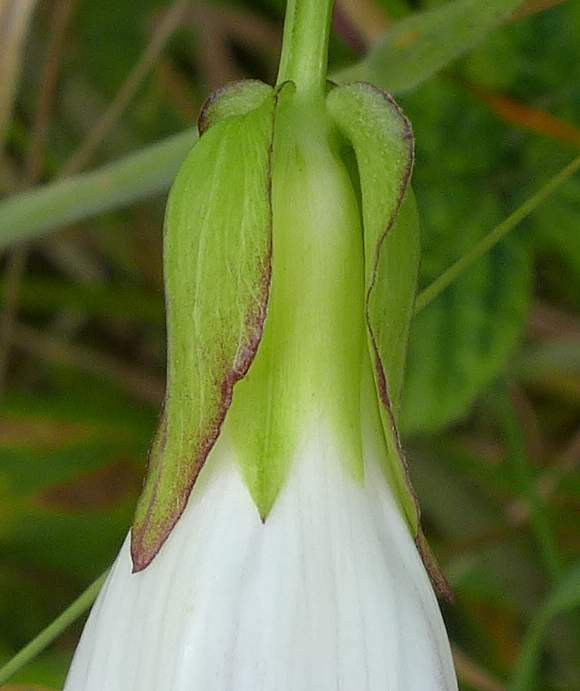 Calystegia sepium ssp. 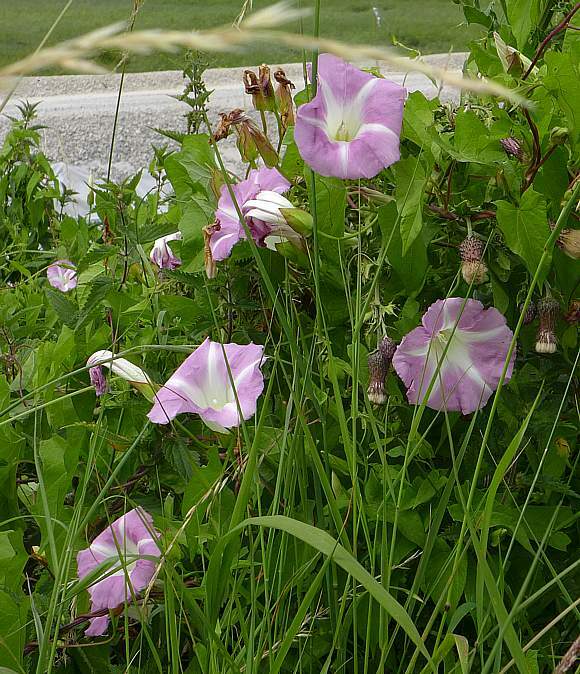 sepium which has white flowers OR pink flowers with 5 white stripes and can have a slightly smaller corolla (3 - 5cm); stamens 15-25mm long which is found near the western coasts of Britain & Ireland & the Channel Islands. 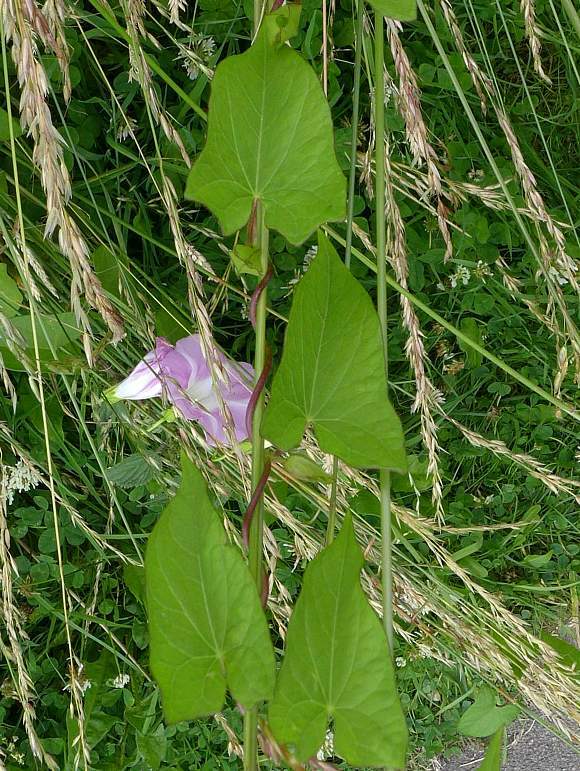 Bindweeds have five fused petals forming an un-interrupted trumpet, but with five longitudinal creases. 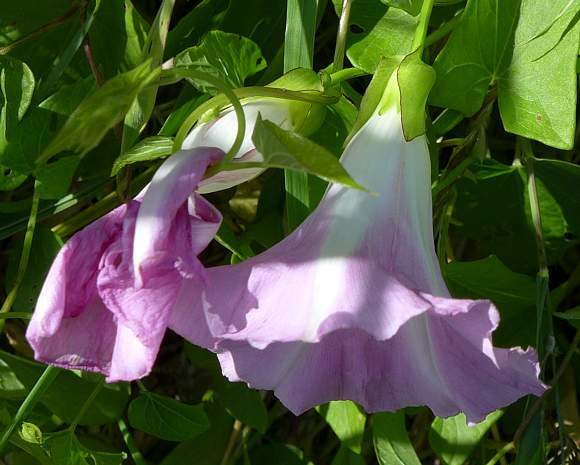 It is native and is found on rough and waste ground, in hedges, or by water such as ditches, fens or marshes.